June 2004, Antibes, Port Vauban. On the quay the sailing population, still sleepy from the night's festivities, hesitates to get back into swing. Not so Malcolm Bromilow who, punctual and impeccable, is waiting for me at nine o'clock in the cockpit of Sonny, a cutter designed by Sparkman & Stephens in 1935. Together with White Wings (1924) and the modern schooner Borkumriff IV, Sonny is part of the small fleet that Malcolm commands. Not far off, this year's Voiles d'Antibes president of honour Mr. Olin Stephens looks on top form as he scrutinises all his splendid creatures moored side by side. From the more recent Alnair III and Crazy Life to the legendary names aboard which he races every day: Stormy Weather, Dorade and Sonny. A few photos of the skipper and then I start with the questions. Bromilow is very polite and concise and the interview proceeds, though I felt rather uneasy talking to someone while being observed by the History of yachting! Nationality: British, more precisely Scottish. Current vessel: there are actually three: Sonny and White Wings, which are small 1930's cutters (16.22 and 15.24 metres respectively) used for classic yacht races, and Borkumriff IV, a modern schooner. Vessel's designer, boatyard, technical and design features: Borkumriff IV was inspired by the topsail schooners of the American east coast. 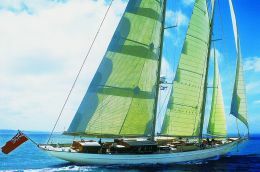 Designed by Gerard Dijkstra and John G. Alden, she was built, in aluminium, by Royal Huisman Shipyard BV and launched in spring 2002. About 48 metres long plus the bowsprit, a 9.24 metre beam, draft of 4.45 metres and 298.80 tons displacement. When she's not under sail (1164 square metres), power and a speed of 14.6 knots are supplied by an MTU 1072 HP engine. The mainmast (47 metres) and the mizzen (40 metres) are in aluminium while the Park Avenue type booms are in carbonium. Interior design and materials: classic layouts designed by John Munford, with owner's suite, guest area and a great saloon. Single cabins for the six crew members and the skipper. Mahogany and capitonne leather for the interiors, teak for the exteriors. 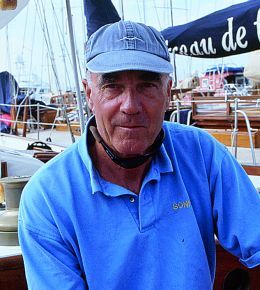 Favourite marina (Malcolm Bromilow loves too many ports to name only one, so here are his top four): Port Vauban at Antibes; Bonifacio in southern Corsica where ". with Borkumriff in fact you just manage to slip in"; Camden on the coast of Maine and the enchanting Tobermory, rich in colour and legend, on the northwest coast of Scotland. Favourite route: the East Coast of the United States, where Borkumriff IV cruised after launching, in search of traces of her historical roots, and the coast of Croatia which is still fairly wild. What technological innovations in yachting interest you, and why? At this point, with a vessel that lacks nothing in the way of equipment, from satellite systems of navigation and communication to a network of computers positioned at the nerve-centres aboard, it would be easy to elicit a hi-tech reply. But no, Malcolm prefers to tell me that he is very satisfied with the inextensible materials used for running rigging and sails ".you don't have to be there continually trimming, and the sail area gives its best yield." He also appreciates the quality of the new AwlGrip painting cycles. The worst thing that ever happened? Expecting something epic from thirty years of sailing the world, we are surprised to discover what shook the aplomb of this Scot: ten interminable days, in an earlier charter skipper job, with guests who were absolutely impossible to please; "guests from hell" was the precise definition given me by Bromilow! An opinion on your role as Captain and on the world you work in? Too much bureaucracy, more time spent on authorisation forms than on sailing!